When you need to quickly and accurately record the license plate of any and all vehicles traveling through a single point, whether it be a border crossing or just a secure parking facility, you need a system that will perform no matter the conditions. 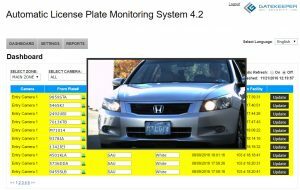 Gatekeeper Security’s License Plate Reader (LPR) systems offers many advantages over the competition, including the ability to decode plates others can’t. The first major advantage Gatekeeper Security’s LPR systems have is superior image quality. High quality camera specialized for either monochrome or color are combined with Gatekeeper’s computer vision technologies to deliver quality images in any condition. Infrared and white light LED illumination options are available to make sure image quality is always at its best, no matter the weather or lighting. Second, the Optical Character Recognition (OCR) software used to decode the image is tuned to best suit the environment that the LPR system is deployed in. This software is extremely fast and accurate and ensures the systems succeeds where others fail. When used with Gatekeeper Security’s other technologies, such as the Automatic Under Vehicle Inspections System, the DriverCam Technology, or Container Code Reader the data from LPR systems is compiled into a single presentation for the operator. Using these technologies in tandem gives operators a more complete record of the vehicle and helps them identify any potential threats. This entry was posted on Friday, February 24th, 2017 at 2:22 pm. Both comments and pings are currently closed.